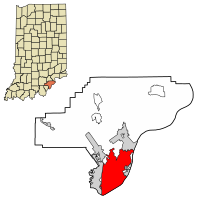 Location of Jeffersonville in Clark County, Indiana. ↑ "American FactFinder". United States Census Bureau. मूल से September 11, 2013 को पुरालेखित. अभिगमन तिथि January 31, 2008. ↑ "US Board on Geographic Names". United States Geological Survey. October 25, 2007. अभिगमन तिथि January 31, 2008.